You have the perfect date planned for Valentine’s Day. But, what about the gift? This year, ditch the typical Valentine’s Day chocolates and stuffed animals and give your love something they can really use – a gift card! Think it’s impersonal? Not anymore. Here are four reasons why gift cards make the best gift. A gift card let’s the gift bearer choose exactly what they want. Candles? A massage? A soothing facial treatment? Anything is a possible gift when you get a gift card! You’ve already planned a magical date. Why spend hours searching for a gift? It’s too stressful and time-consuming. Pair a gift card with a sweet handwritten note and some flowers, and you’re good to go! According to Time.com, three out of four Americans don’t like the gifts they receive and Giftcards.com says 90% of gift cards are used within 60 days. A gift card is the perfect way to say “I love you” and is a great present! According to NRF’s 2012 Holiday Survey, 60% of respondents stated they actually want a gift card. While people may appreciate the thought behind a gift, it can be a hassle for them to have to return it for something they really want. Save everyone the trouble and start with a gift card from the beginning! 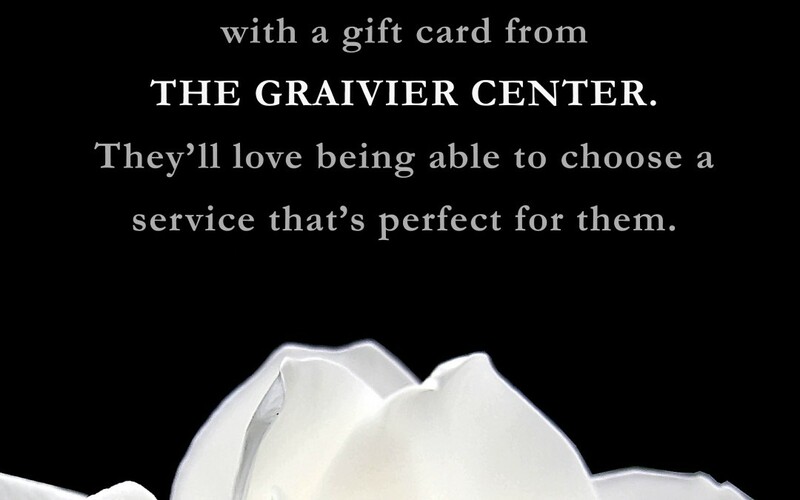 At The Graivier Center, our gift cards can be used for any of our many services, including our relaxing massages, which happen to be 20% off this month. Don’t delay! Stop by our office for the perfect Valentine’s Day gift – a gift card.